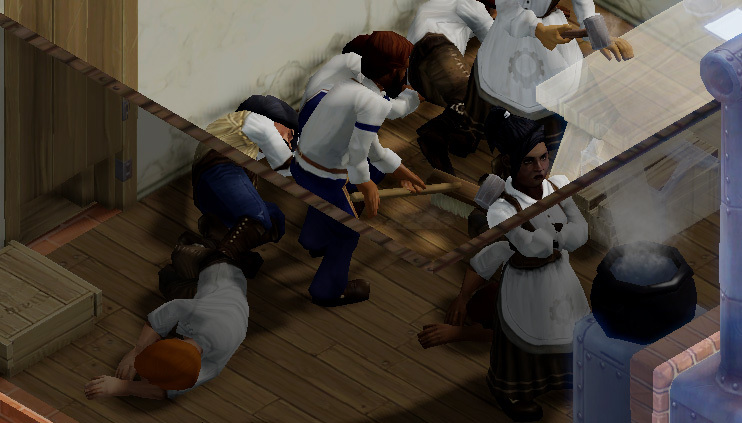 All posts tagged with "does anybody even know what is going on in our screenshots any more"
Clockwork Empires 30B released: Saves, Unicode. We’ve pushed version 30B to the public branch today, which will contain saves as well as support on Windows for user names with Unicode characters. If you have the update, you should see “Version 30B” on your screen in white text in the upper right hand corner. You shouldn’t need to do anything else. Whoever controls the stew controls the colony. Here, the Law of Stew reigns merciless. Saves are still a work in progress, and there are a handful of bugs we’re fixing, so keep a sharp eye out. If your save fails to load the first time, try it again (we’re not sure what causes that quite yet but we have Top Men on it). If you get a random crash related to saving or loading, please let us know on the forums and send us a .DMP file.